LEDRU (Le Dru), JEAN-ANTOINE, priest; b. 1752 in France; d. in or after 1796. It appears that Jean-Antoine Ledru made his religious profession with the Dominican order at Arras, France. In 1773 he moved to its convent in Paris, where he remained until the winter of 1774. The date of his ordination is unknown. It seems likely that he left the order for the secular priesthood, although it is possible that he remained with it and joined a contingent of Dominican missionaries in the West Indies. He was referred to as a Dominican while in North America. Ledru arrived in Nova Scotia in the summer of 1786 and was sent by Vicar General Joseph-Mathurin Bourg to serve St Mary’s Bay and Cape Sable. That fall he began an extensive missionary tour, without the permission of his superiors. At Shelburne he was asked to go to St John’s (Prince Edward) Island, whose Catholic inhabitants had been without the services of a priest since the death of James MacDonald in 1785. Having first visited Arichat and Pictou, Ledru crossed to the island just before Christmas Day, 1786, and spent the winter at Fortune Bay. The following spring he travelled to the Îles de la Madeleine and Cape Breton. His long absence from St Mary’s Bay does not seem to have worried him, for he visited Thomas-François Le Roux at Memramcook, New Brunswick, before returning to his mission. After Ledru’s arrival in Nova Scotia, correspondence had passed between Bourg and the bishop of Quebec concerning the validity of his qualifications. The fact that he had arrived in the area without any letters of authorization from the Dominicans had caused some suspicion, and when parishioners began to complain about his irresponsibility, the question arose whether or not he was an impostor. 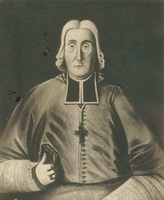 Although Abbé Bourg was able to confirm that Ledru had been regularly ordained, in 1787 Bishop Louis-Philippe Mariauchau d’Esgly ordered his immediate dismissal from Acadia. 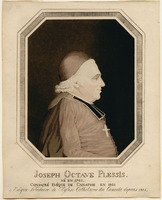 It was the bishop’s opinion that Ledru was unreliable, in view of his inability to stay in one location, and dishonest since “in the guise of probity and zeal, [he] has taken, in the absence of missionaries, large sums of money from people too simple to mistrust the deceit.” Given the British government’s suspicion of French priests from abroad, it must have seemed even more unwise to harbour Ledru longer. Ledru nevertheless remained in Nova Scotia until the late spring of 1788 and created dissension which was to last for some years. On his return to St Mary’s Bay in 1787 he had discovered that the people there no longer regarded him as their priest. Perhaps in revenge he petitioned Lieutenant Governor John Parr that certain religious vessels which were in private hands be given to the church at Cape Sable. The people of St Mary’s Bay, who also needed a communion service, were incensed, and the controversy over possession of the vessels was not finally settled until 1806, when Bishop Joseph-Octave Plessis* made an official decision in favour of the larger community at St Mary’s Bay. In 1789 Ledru accepted an appointment to settle at Kaskaskia in the Illinois country. Within a few months of his arrival in September, his bishop, John Carroll of Baltimore, became concerned about him. No letter had come from France attesting to Ledru’s character and authorizing his stay in North America; moreover, the bishop had received unsettling news concerning his activities in Acadia. Meanwhile, Ledru, finding the tithes at Kaskaskia insufficient for his support, had been persuaded by a better offer to move to St Louis (Mo. ), in Spanish Louisiana. He was forced to leave there, probably in the fall of 1793, after a quarrel with the commandant, who claimed that Ledru had “discontented these parishioners by an interest and a commerce which give him lawsuits with everybody, vexing them further by extravagant fees in all the ceremonies of his ministry.” Ledru apparently wintered at Fort St Joseph (Niles, Mich.) before travelling to Michilimackinac (Mackinac Island, Mich.), where he exercised his ministry without authorization and where his name appears on the baptismal registers from May to July 1794. He then went to Detroit, intending to carry on to Fort Erie, but the governor general, Lord Dorchester [Carleton*], had received disquieting reports about his republican sympathies and in June 1794 advised Lieutenant Governor Simcoe* of Upper Canada to deny him entry. Ledru had to stay at Detroit, where he was forced to rely on rations from the commandant. In the delicate period before the signing of Jay’s treaty in November 1794, the British were much concerned about republican agitation in the vicinity of the western posts, particularly those close to the Upper Canadian border. The authorities intended to return Ledru to Michilimackinac, but because no boat was available, he was sent to Fort Erie. “If he is ill disposed or his principles considered republican,” wrote the commandant at Detroit, “this is by no means a proper place to suffer him to remain. . . .” In September Dorchester secured the transfer of the Reverend Edmund Burke* to Raisin River, south of Detroit, “expressly to counteract the Machinations of Jacobin Emissaries.” Although it is not clear if Ledru had visited the Raisin River area, the governor general had perhaps been alarmed by a petition from the inhabitants to have Ledru as their priest. In October 1794 Ledru received an official order of banishment from Simcoe for having behaved “so improperly.” He was to leave Upper Canada by way of Oswego, N.Y., and never to return to any British province. His subsequent activities are unknown. Writing to Bishop Jean-François Hubert of Quebec in March 1796, Bishop Carroll noted apropos of Edmund Burke that “ill-intentioned people, and especially an apostate Dominican named Le Dru, have found a way of inspiring certain officers of the American troops posted in the vicinity of Fort Detroit, with prejudices against that priest.” This letter suggests that Ledru had found his way back to Detroit. No further record of him has been found. The image he projects is not that generally associated with French missionaries in British North America, for wherever he had gone he had come into conflict with the authorities. AAQ, 7 CM, I, 12. Archivo General de Indias (Seville, Spain), Sección, Papeles de Cuba, legajo 208A. CÉA, Fonds Placide Gaudet, 1.54–15,1.88–9,1.88–12. Before Lewis and Clark: documents illustrating the history of the Missouri, 1785–1804, ed. and intro. A. P. Nasatir (2v., St Louis, Mo., 1952), I, 132, 203. Correspondence of Lieut. Governor Simcoe (Cruikshank), II–V. Kaskaskia records, 1778–1790, ed. C. W. Alvord (Springfield, Ill., 1909). “The Mackinac register,” ed. R. G. Thwaites, Wis., State Hist. Soc., Coll., XIX (1910), 97–102. Allaire, Dictionnaire, I, 330. Caron, “Inv. de la corr. de Mgr Hubert et de Mgr Bailly de Messein,” ANQ Rapport, 1930–31, 199–351; “Inv. de la corr. de Mgr Mariaucheau D’Esgly,” ANQ Rapport, 1930–31, 185–98. Antoine Bernard, Histoire de la survivance acadienne, 1755–1935 (Montréal, 1935), 241–42. P.-M. Dagnaud, Les Français du sud-ouest de la Nouvelle Écosse . . . (Besançon, France, 1905), 49–50. A.-H. Gosselin, L’Église du Canada après la Conquête, II, 164–65, 289. A. A. Johnston, A history of the Catholic Church in eastern Nova Scotia (2v., Antigonish, N.S., 1960–71), I, 120–32, 150, 170. Émile Lauvrière, La tragédie d’un peuple: histoire du peuple acadien de ses origines à nos jours (2v., Paris, 1922), II, 343. W. R. Riddell, The life of John Graves Simcoe, first lieutenant-governor of the province of Upper Canada, 1792–96 (Toronto, ), 264–65. Placide Gaudet, “Les premiers missionnaires de la baie Ste-Marie . . . ,” L’Évangéline (Weymouth Bridge, N.-É. ), 9 juill. 1891, p.; 16 juill. 1891, p..
Della M. M. Stanley, “LEDRU, JEAN-ANTOINE,” in Dictionary of Canadian Biography, vol. 4, University of Toronto/Université Laval, 2003–, accessed April 19, 2019, http://www.biographi.ca/en/bio/ledru_jean_antoine_4E.html.